I’ve been struggling with my email setup for a while now, figuring out how I want my email to work for me. This is a simple post about what I have settled on for the time being. No surprise here, I use Apple’s Mail application as the central hub for my email activity. I keep all of my accounts in here that I use from day-to-day and the same goes on my mobile devices as well (an iPhone and iPad). The updates in Lion were very welcome and I have a pretty decent system down for how to work with Google Apps. However, what accounts do I have? I used to use a generic Gmail account I’ve had around for years, but I was leery of keeping that as my main address not because I don’t like Gmail (even though I have my complaints), but because I liked the idea of having my own personal domain host my main email account. 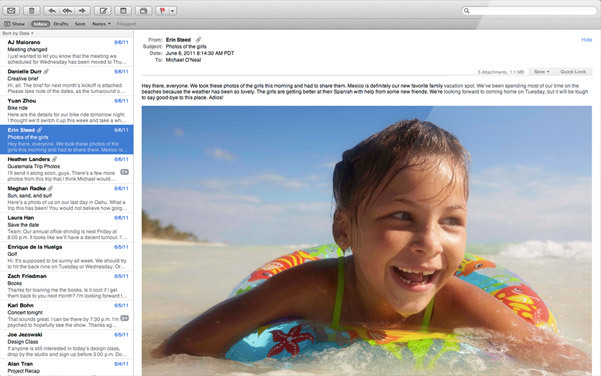 So I have settled on Google Apps (Free) to host the email for bobmartens.net. However, that’s the only thing I host here: email. I have disabled Docs, Calendar, Chat, etc. and am running with only Mail and Contacts on this domain. I keep my actual Contacts and Calendar in iCloud. I was going to move all of my Google services over to my own Google Apps account, but it became a hassle when Google Plus is not enabled for Google Apps accounts and what if I would want to move my email address to another service provider? Then I’d lose all of my Google stuff as well. Not ideal. I have a similar setup for Deck78. Martin Luther College moved to Google Apps for Education about a year ago, and that is what I use at work during the day. I have a single Google Calendar as well because that works best for me at the moment. I also use Google Chat on this domain as well because everyone else does and sometimes people will get a hold of me through it. I had toyed with hosting email at home with Lion Server, but I scrapped that idea in favor of the simplest solution for the moment because I would really like to have a static IP address to do that, but it would cost me at least twice as much per month in order to get that service through Comcast, which I really can’t afford at the moment. Ultimately, this gives me the flexibility that I require for the future (if I would switch my domains to my own server) while provided some features I need/want right now (like mobile push email). If Apple would open up iCloud to hosted domains, I’d entertain the idea of switching to that, but I’m satisfied with this at the moment. Google Apps for mlc-wels.edu – email, calendar, docs, etc. Gmail Account – docs, calendar, reader, groups, etc. I’ll see how long I stick with this setup. UPDATE: I forgot to add that I am forwarding my old Gmail address to my new personal Google Apps one. That way it is easier for everyone and I don’t miss any important email. I’ve toyed with the idea of setting up something either via a web host or Google Apps, but it always seems more work than it’s worth. With my new .me domain purchase I think the best solution for me is to use email forwarding, to whichever provider I decide to use. That way I’m not locked down into any one setup, and I can use the interfaces my family and I are familiar with. I’m going to add an update stating that I am forwarding all of the mail from my old Gmail account to my new bobmartens.net account so that I don’t miss anything and to make it easier on people. I think that is needed. Glad to see Google Apps is a good solution for you right now! It sounds like you are pretty happy using the Mail app, but in case you ever need to check your mail on a friend’s computer or on-the-go, I wanted to recommend a few Gmail features. First, if you open your Gmail Labs settings, you can enable the Preview Pane lab to create a similar viewing experience to the one you seem to be using in your screenshot. You can also turn off Conversation View on the General tab of your Settings if you prefer your messages unthreaded. Finally, since you are juggling multiple accounts, I want to make sure you know about multiple sign-in, which lets you access all of those accounts at once in one browser window. Just visit your Account Settings, enable multiple sign-in, and then click your email address in the top corner of your account to switch between. One other tip that works regardless of where you access your mail — I use a catchall on my own private Google Apps domain, so I can hand out different email addresses for specific purposes but any replies go to the same account. This makes it easy to see who is sharing your email address, by the way. When you sign up for a website, you can use [websitename]@bobmartens.net as your email address. If you have your catchall pointing to your main account, all mail sent there will end up in your main account… and if you start getting spam to that address, you know that website gave away your info or was compromised.